I too was greatly saddened when I read this piece in the Telegraph. It's also very sad that in our politically correct, so-called multicultural nation, even pointing out such awful racism can bring its own condemnation from the liberals and lefties among us. Yes, it's pretty bad when the bullies blame the person bullied for being bullied. Congrats on your family's BAFTA success, Chris. My next post here will be about that. You allude to an important point in this article. You mention the rise of anti-Semitism, the subsequent return of Jews to Israel as a result of such attacks and tie this in (as well as other factors) to bolstering the narrative believed by millions of Christians that God is continuing to restore His people to the land of their forefathers. I wonder if folks on this blog would view this as the wrong / right Christian approach? As for me I am a torn on this issue. AntiSemitism IS wicked, but is it possible for God to use a wicked situation to fulfil his own purpose? 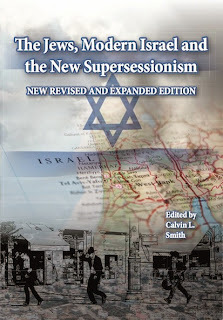 Those of us who question Christian Zionism and the action of the State of Israel do need to be careful how we argue our case because of the danger of inflaming hatred against one group or another, especially Jews - I hope I have done that in my book by aknowledging the very real suffering of Jews historically and seeking to address the security issues for Jews. But to what extent do we see Jewish suffering as worse than the suffering of others, (such as Russians in WW2 where millions died as well as acknowledging the Jewish holocaust victims) and create a sort of victim mentality which only perpetuates further suffering and persecution against Jews? When people are forced to do penance for the action of their forefathers, there is a danger that people rebel and commit the same crimes - thus perpetuating the cycle of hatred. Surely we need to be seeking to break the cycle of violence through forgivness and understanding and mutual respect for our common humanity. I am also concerned about a 'social leftist gospel' mentality which tends to focus more on human activity and a belief in human progress than of working with prayer and within God's grace. Human effort has to be balanced with God's grace. I am not convinced either way by the media and current events, the highest authority is the Word of God, of course how one interprets it will affect/inform their world outlook. I have never needed the media to 'bolster' the 'narrative' that I already hold ( by my reading of scripture) ie, that the Jews will be regathered to their land. I believe the Lord is not short of 'imaginative' ways of bringing that about, and maybe He uses christian zionists or maybe He doesn't.